Prince Harry says he is "thrilled" after announcing he is to marry US actress girlfriend Meghan Markle. Prince Harry said it had been a romantic proposal, while Ms Markle said she was "so very happy, thank you". Ms Markle, wearing a white belted coat, held Harry's hand as they appeared briefly for the press at the palace's Sunken Garden, and showed off her diamond engagement ring. Asked by a reporter when he knew Suits star Ms Markle "was the one", Prince Harry said: "The very first time we met". A TV interview the couple are giving to the BBC's Mishal Husain will be broadcast at 18:00 GMT. Kensington Palace said Ms Markle's engagement ring was designed by Prince Harry and features two diamonds which belonged to his late mother, Diana, Princess of Wales. Downing Street said there are "no plans" for a bank holiday on the day of the wedding. Prince Charles also said he was "thrilled", adding that Ms Markle's parents had given their blessing. Prince Harry had already told the Queen and "other close members of his family" of the engagement, which took place in London earlier this month, Prince Charles said on Twitter. 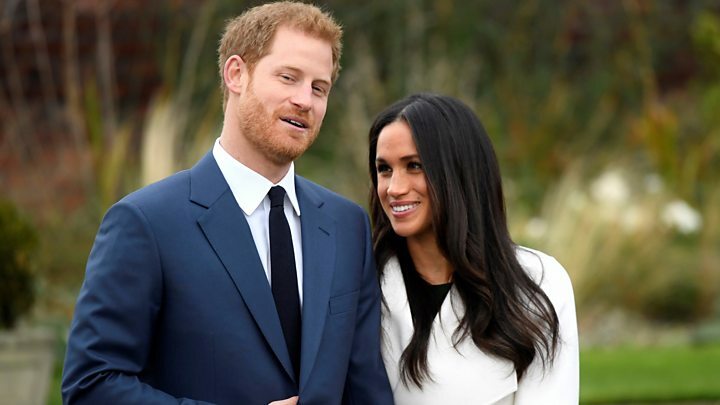 The announcement, issued by Clarence House, the Prince of Wales and Duchess of Cornwall's official residence, said details about the wedding day would be unveiled "in due course". The Queen and Duke of Edinburgh said they were "delighted for the couple and wish them every happiness", a Buckingham Palace spokesman said. Prince William and Catherine, Duchess of Cambridge, said they were "very excited for Harry and Meghan", adding: "It has been wonderful getting to know Meghan and to see how happy she and Harry are together." Justin Welby, the Archbishop of Canterbury, whose predecessor officiated at the Duke and Duchess of Cambridge's wedding in 2011, wished them "many years of love, happiness and fulfilment". Ms Markle's parents, Thomas Markle and Doria Ragland, said their daughter was a "kind and loving person" and they were "incredibly happy". They added: "To see her union with Harry, who shares the same qualities, is a source of great joy for us as parents." Prime Minister Theresa May offered her "very warmest congratulations" and wished the couple "great happiness for the future". Labour leader Jeremy Corbyn said: "I wish them well - I hope they have a great life together." 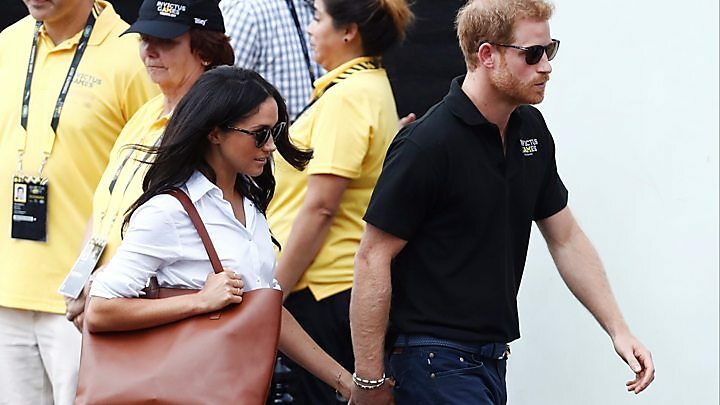 Prince Harry, 33 and Ms Markle, 36, made their first public appearance as a couple in September at the opening ceremony of the Invictus Games, a sporting event set up by the prince for injured, wounded and sick soldiers. Their married home will be the prince's current residence, Nottingham Cottage, on the grounds of Kensington Palace - where the Duke and Duchess of Cambridge, with Prince George and Princess Charlotte, also have an apartment. Their 16-month relationship began in July 2016 when they met through mutual friends in London. Prince Harry first confirmed his relationship with Ms Markle in November 2016, in a statement from Kensington Palace attacking the media for subjecting her to a "wave of abuse and harassment". That statement said the couple were "a few months into a relationship" and it was "not right" that Ms Markle should receive such treatment. It described nightly legal battles to keep defamatory stories out of papers, attempts by reporters and photographers to get into her home and the "bombardment" of nearly every friend and loved one in her life. Ms Markle spoke about her love for the prince for the first time in September - telling Vanity Fair magazine: "We're two people who are really happy and in love". She said the pair were enjoying a "special" time together, adding: "I'm sure there will be a time when we will have to come forward and present ourselves and have stories to tell, but I hope what people will understand is that this is our time." Ms Markle may not have been a familiar name in the UK until recently, but in the US she was known for her role as Rachel Zane in TV legal drama Suits. She attended a private primary school before studying at a girls' Roman Catholic college and later graduating from Northwestern University School of Communication in 2003, just as her acting career was beginning. What will we call her? The instant Prince Harry and Ms Markle are pronounced "man and wife" she will automatically become Her Royal Highness, Princess Henry of Wales. However, she does not automatically become Princess Meghan - because she is not of royal blood. The Queen's late sister Margaret was entitled to call herself Princess Margaret. The Queen's daughter is Princess Anne and her granddaughters are Princess Beatrice and Princess Eugenie. The Queen's great granddaughter, Prince William's daughter, is Princess Charlotte. All of these are, or were, of royal blood and so are princesses in their own right. But Princess Charlotte's mother, the Duchess of Cambridge, is not known as Princess Catherine, just as the Duchess of York never became Princess Sarah and the Countess of Wessex, the wife of Prince Edward, is not Princess Sophie. Lady Diana Spencer was never officially Princess Diana. She was the Princess of Wales and, after her divorce from Prince Charles, she was Diana, Princess of Wales.